Another Hall of Fame nomination! Important news! Glen and Hy Peskin, a lost founding father of professional bass fishing whom we featured prominently in our book, have been nominated for the Bass Fishing Hall of Fame! Check out their website: http://www.bassfishinghof.com/index.html. 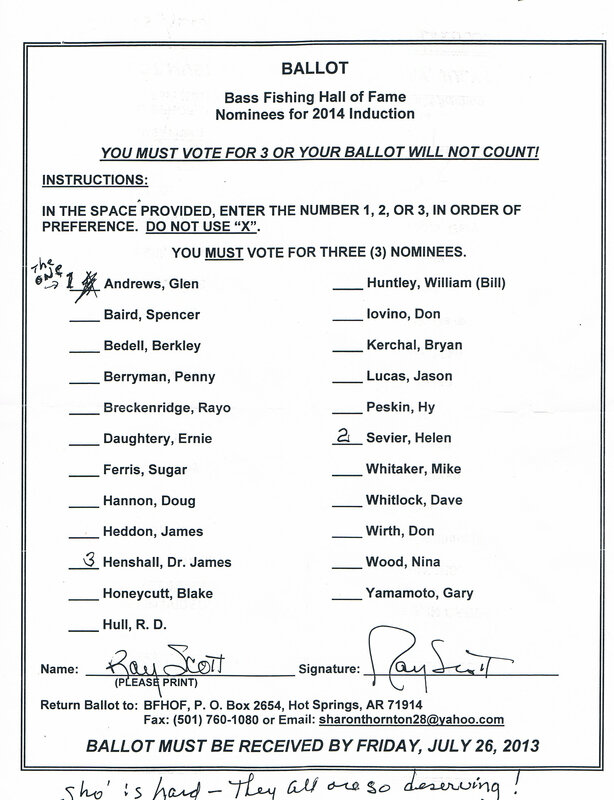 We learned of his nomination from Ray Scott, who sent us his completed ballot. Thank you, Ray, for your support! Getting Hall of Fame recognition for Glen was an important goal for the book. So far, we’ve gotten him into Garry Mason’s Legends of the Outdoors Hall of Fame, and hopefully he’ll get into this second one. According to Terry Battisti, “The book is filled with the history of the sport at a time when there was no history. It’s a must read for those who are ardent historians of the sport and a “you need to read” if you’re a bass fisherman.” Check out the entire article here. Tournament on Bull Shoals Lake, Glen’s old and current haunt, this weekend. The winner, who camped in the back of his truck every night, caught his fish just down the lake from Glen’s and Shane’s houses. Last year, seems like it was late summer, I dropped by the Branson Tourist Center complex in Branson, MO, just off Highway 65 to take a quick restroom break. Being unfamiliar with the place, I was unsure the direction to steer myself when I noticed what looked like an opening behind the clerk’s counter area that could be what I needed (emphasis on the word “needed”). I proceeded around the counter and found myself standing in what looked more like a lobby than a restroom foyer. I began staring austerely around at the many magazine covers on the walls with headlines and pictures of fisherman touting big bass. There was a quaint and smiling gentleman sitting at a coffee table strewn with cups and papers. Observing my confusion, he politely asked me how I was doing and if he could of help. I asked, “What is this place?” just before I saw the banner on the wall that read “Central Pro-Am Tournaments.” After he recited the name for me, I asked who was in charge, and he replied, “Jim Thompson,” and pointed to an open door on his left. A friendly voice came from the doorway that proclaimed, “Come on in!” just like he was expecting me. I slowly strolled through the door and into a small office to find a smiling, tanned and slim gentleman, just slightly older than myself coming out of his chair to shake my hand. Having put bodily functions on hold, I began my spiel. Jim listened intently for at least twenty minutes, and was fascinated how he had never heard of my dad, the first two-time world champ basser. He was uncertain of my story, as anyone should be, since the book hadn’t been published yet. He politely asked if I would be interested in doing some different types of promoting together and of course I was interested. Time passed. After we got published, I sent Jim a book, and he loved it. We stayed in touch, and he asked me if I would bring dad to one of his tournaments to meet him and maybe speak. We came to the weigh-in at a tournament on Table Rock Lake in Kimberling City out back of Ahoy’s Restaurant where we spoke to a small crowd on August 22nd, 2010, and sold a few books. We had a really good time and met some really nice anglers and others within Jim’s fine organization. Jim later asked if we would be interested in speaking at the Midwest Outdoors Expo at the Hilton Convention Center in Branson. What a vote of confidence he had for us. We were honored. We did go to the event on October 9th and had a great time. More importantly, Jim introduced me to a couple of VIP’s he had as guest speakers and visitors to the Expo. One was Jerry Martin of Bass Pro Shop’s Redhead Pro Hunting Team. He is famous as an outdoor hunting guru and is Co-host of Bass Pro Shop’s 100% Real Hunting show on the Versus Network and Co-host of Bass Pro Shop’s King of Bucks on the Outdoor Channel. He is also an Outdoor Hall of Fame Inductee like dad. He gave us a good chunk of his time and, like Jim, couldn’t believe he had never heard of dad. I believe he was very impressed with our work, and he bought a book. He told me that he and Johnny Morris, owner of Bass Pro Shops, were quite tight and offered to give Johnny a copy of AIC. We also met and charmed John Neporadny, a senior writer for Bassmaster and Bass Times Magazines. He took a book home with him citing he would put the one down he’d been working on and read ours. We hope to have an article about us in one of those two periodicals. Let’s keep praying that “Everything Happens for a Reason” (reference December 3rd, 2009 blog entry). Dad and I want to thank Jim, Mike West, Kris and Ryan for a great time and opportunity on Saturday at the Expo. We were moved at their helpfulness and courtesy. Oh, and by the way, Jim, where the heck is that restroom anyway!